This Easy Garlic Herb Roast Chicken recipe is the most straightforward, foolproof way to roast any whole chicken. Infused with herbs and spices and roasted with onions, garlic, mushrooms and herbs, Roast Chicken will be perfectly juicy and tender in just 35 minutes. 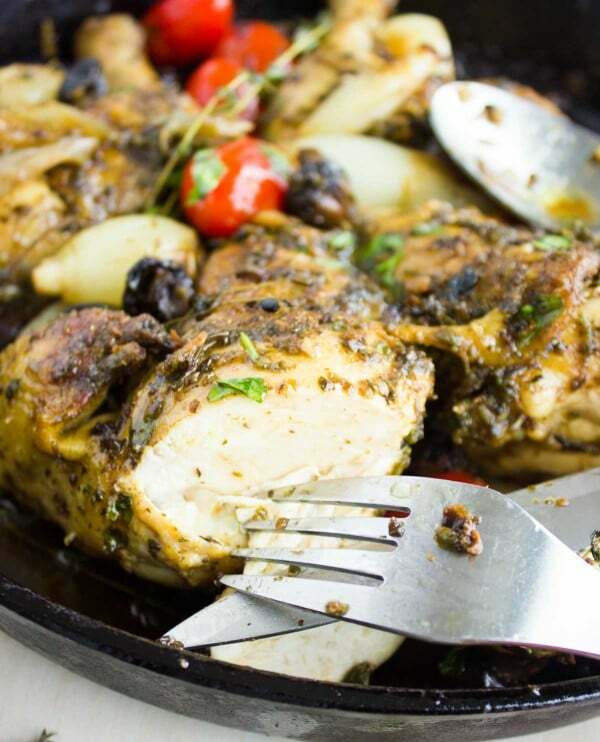 I have to say, other than the fact that I really wanted to share this awesome Garlic Herb Roast Chicken recipe, and besides the fact that it’s a favorite at many of my cooking classes because of how easy and versatile it is, there is another reason. A few months ago, I read a post from a very popular food blogger about her failures each time she roasts a whole chicken. 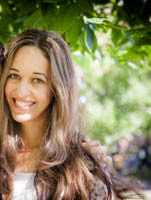 And not only that, she has come out and declared the end of trying to ever roast a whole chicken—and showed many horrific photos to support her case. I thought it was super funny and brave the way she expressed her frustration with Roast Chicken. 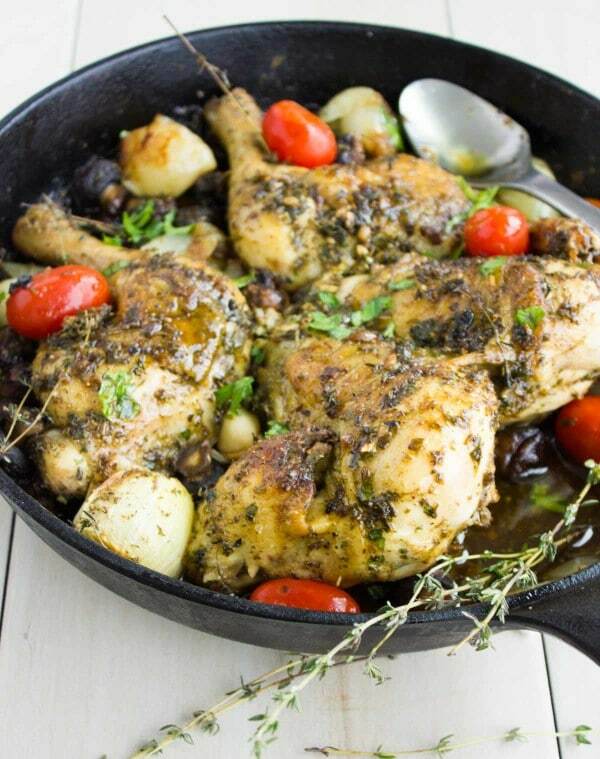 But then I remembered I know quite a few people who feel just the same, so I thought this Easy Garlic Herb Roast Chicken recipe had to come to the rescue! This is truly the easiest Garlic Herb Roast Chicken recipe and the most straightforward, foolproof way to roast any whole chicken. 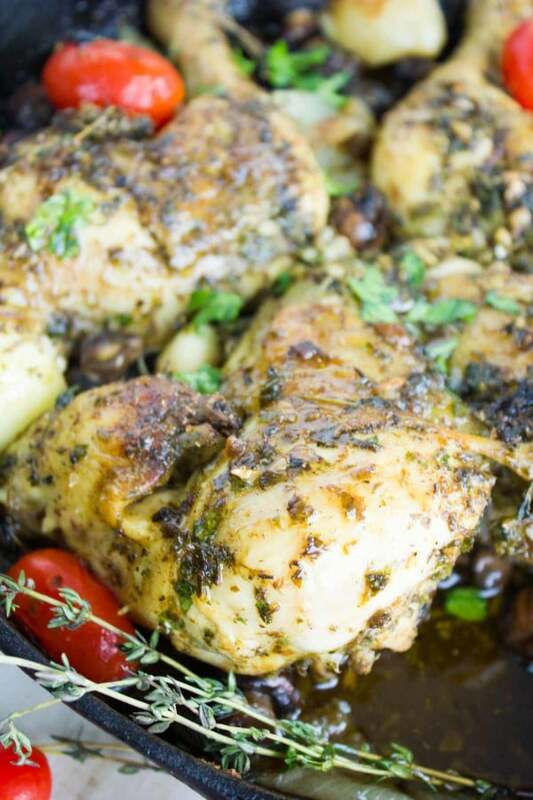 In this recipe, the chicken is infused with garlic, herbs, spice and roasted with whole baby onions, garlic cloves, mushrooms and herbs. 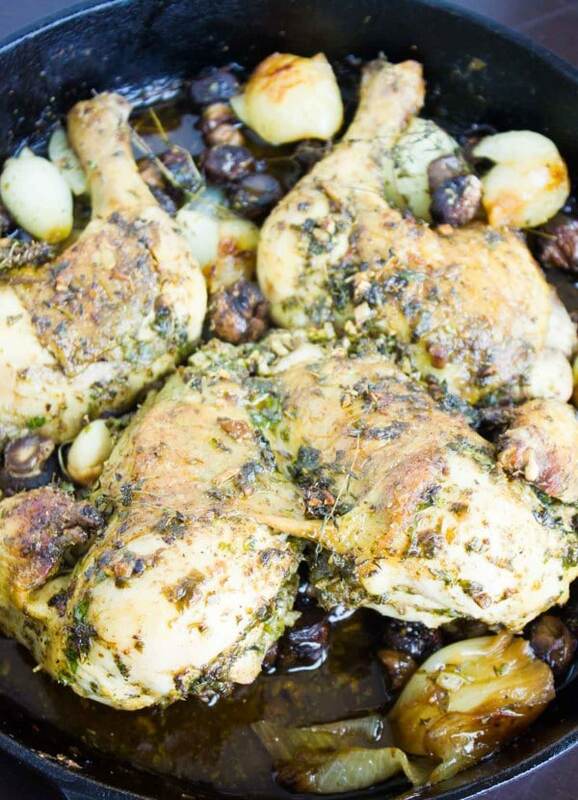 Prepared that way, the Garlic Herb Roast Chicken will be perfectly juicy and tender in just 35 minutes with a few tips and tricks. 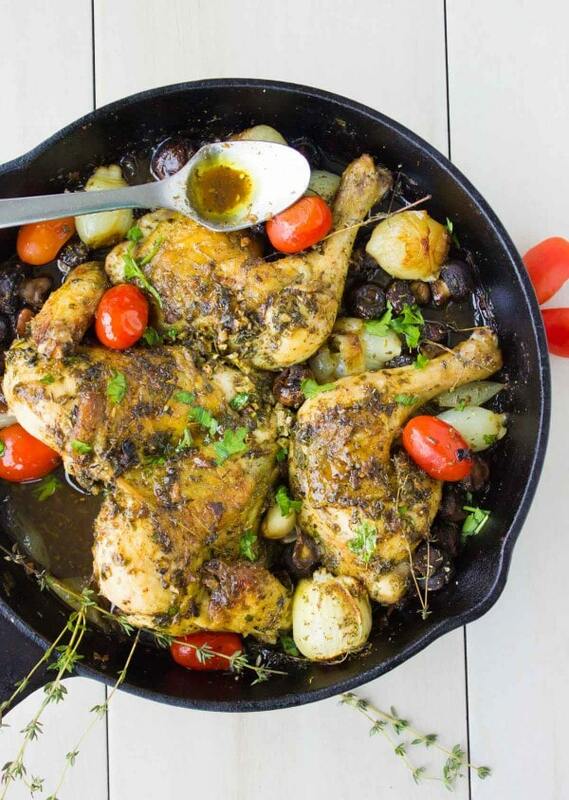 Use your favourite spices and serve it in endless ways—this Garlic Herb Roast Chicken is a go-to recipe and a real time saver for busy home cooks! Most of us hesitate to roast a whole chicken for different reasons, I think the most common reasons are either the time factor or the fact that it overcooks and dries out easily—or doesn’t cook all the way through. The very first time I ever attempted to make a whole roast chicken, for some reason I faced another frustration—the chicken was so very bland, I remember shredding it, tossing it with a ton of spice and making quesadillas with it the next day! 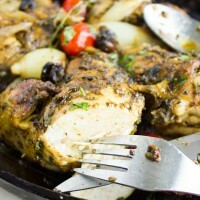 With this Garlic Herb Roast Chicken being so flavorful, I am afraid there’ll be no need for making quesadillas. Sorry. 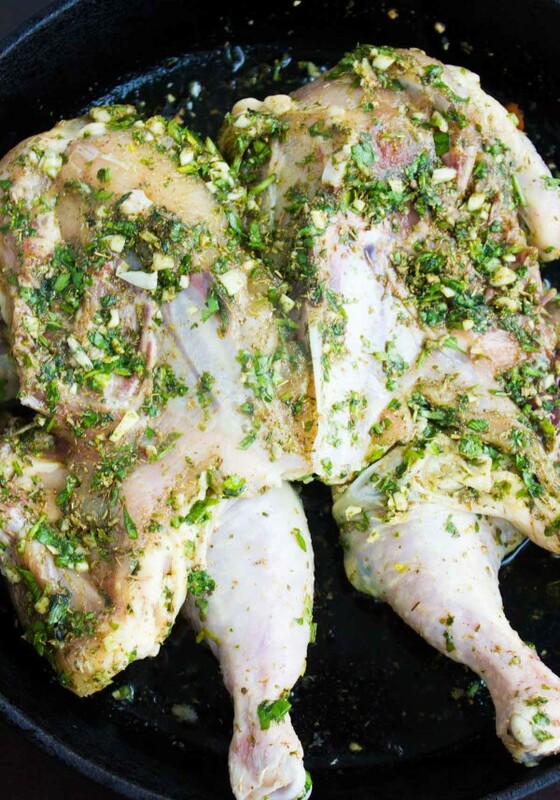 This Easy Garlic Herb Roast Chicken recipe starts by butterflying the chicken, which simply just means removing the backbone of the chicken and smashing the middle bone of the chicken breast making the chicken look like a butterfly. The photos are best to explain. This tiny little trick which you can ask your butcher to do for you, or take a couple of minutes to do yourself, saves 20 minutes of cooking time in the oven—so it’s well worth it. Another thing is, it allows you to rub all your spices and flavors right into the chicken. I sear the chicken skin side down for 3 minutes before I roast it. This gives the skin a beautiful golden crust even before roasting and spares you from waiting for the skin to crisp up in the oven while worrying about the chicken drying out. After I sear the chicken skin side down, I flip the chicken and then throw in tiny baby onions, whole garlic cloves, fresh herbs, mushrooms and finally the chicken is ready for roasting. You can add small baby potatoes, green beans, or any veggies you like. A really silly tiny tip about the veggies added in—might sound tedious but it does make a difference, just a pinch of salt, spice and olive oil tossed into those veggies before they get roasted will make a huge difference in the final taste. The flavors in this Easy Garlic Herb Roast Chicken are simply amazing—plenty of garlic and herbs. I use a mixture of cilantro, parsley, thyme and mint. Further additions are minced garlic, lots of dried oregano, and finally some allspice and cinnamon. 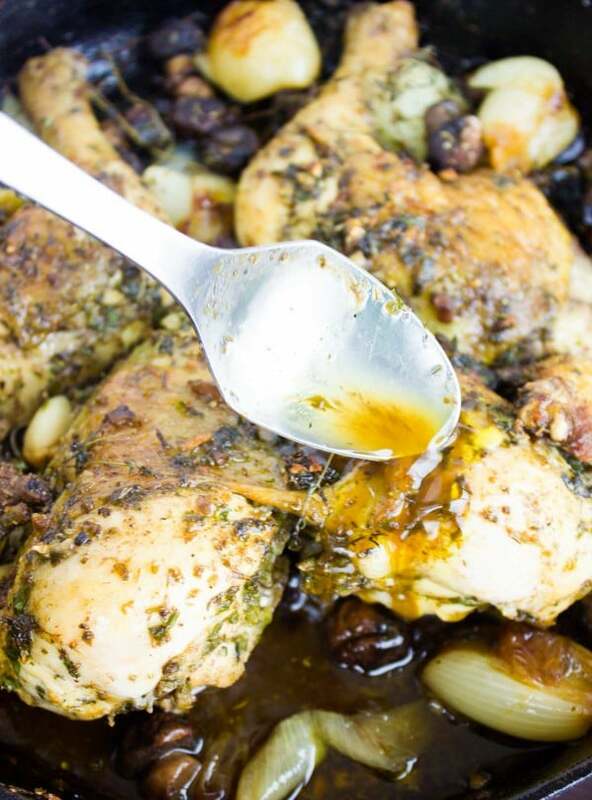 This bit of cinnamon adds so much to the Herb Garlic Roast Chicken and you won’t ever taste it, I promise! You can try so many different spices and flavors, the sky is your limit. The Garlic Herb Roast Chicken cooks for 35 minutes and when it’s out I splash it with a quarter cup of orange juice or even apple juice. Searing the chicken skin side down gives the skin a beautiful golden crust even before roasting and spares you from waiting for the skin to crisp up in the oven while worrying about the chicken drying out. Butterflying the chicken speeds up the roasting process and makes for a more evenly cooked chicken. Use any herbs you like for this recipe. Add mint for a Middle Eastern touch, cilantro for a Mexican twist! This Easy Garlic Herb Roast Chicken recipe is the most straightforward, foolproof way to roast any whole chicken. 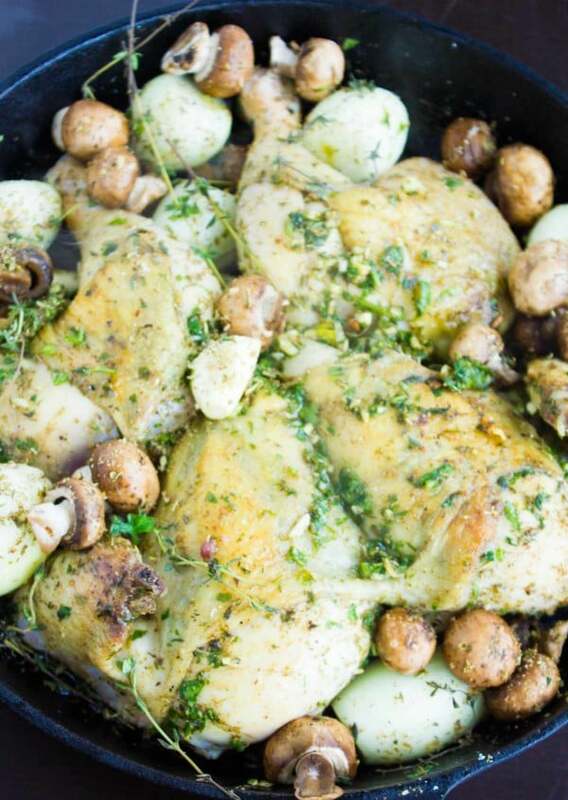 Infused with herbs and spices and roasted with onions, garlic, mushrooms and herbs, this Roast Chicken will be perfectly juicy and tender in just 35 minutes. Mix the garlic, herbs and spice in a bowl and then take this mixture and rub it all over the chicken, on both sides and in between the skin and the meat. 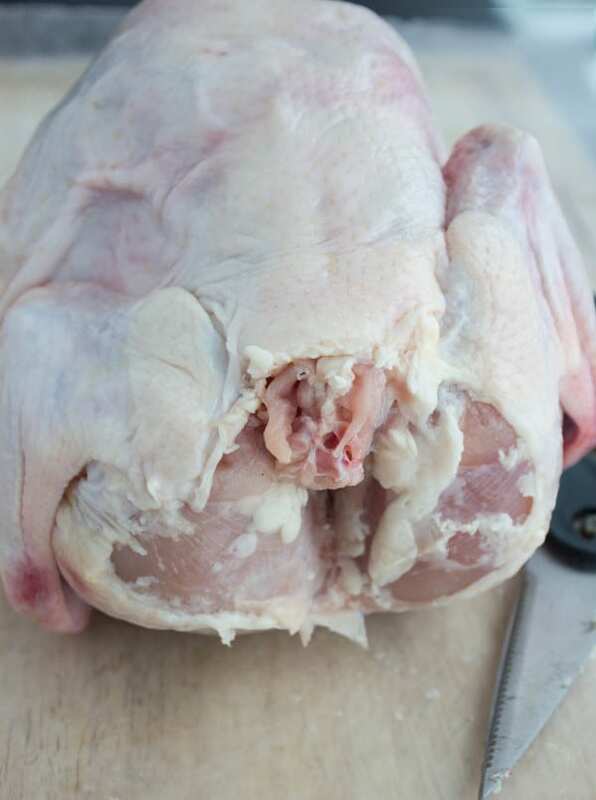 To do this, gently take your fingers and place them in between the skin and meat of the chicken separating them as much as possible while still keeping the skin attached to the chicken at corner points. Place a cast iron (or oven-safe skillet) over medium-high heat and add in the olive oil. When the oil heats up, place the chicken skin side down in the hot skillet and sear it for 3 minutes. In the meantime, mix the onions, garlic, mushrooms with the olive oil, salt and oregano mixture. Flip the chicken and throw in the onions, mushrooms and garlic scattering them all around the chicken. Let the chicken cook for a minute before taking the skillet off the heat. Place the skillet in the oven and roast for 35-40minutes (depending on the size of your chicken). When the chicken is out of the oven and the pan is still hot, add the grape tomatoes and then add in the juice and mix it with the juices at the bottom of the skillet. Cover the chicken with this juice. Serve. To butterfly a chicken, place a whole chicken on a cutting boars, breast side down. 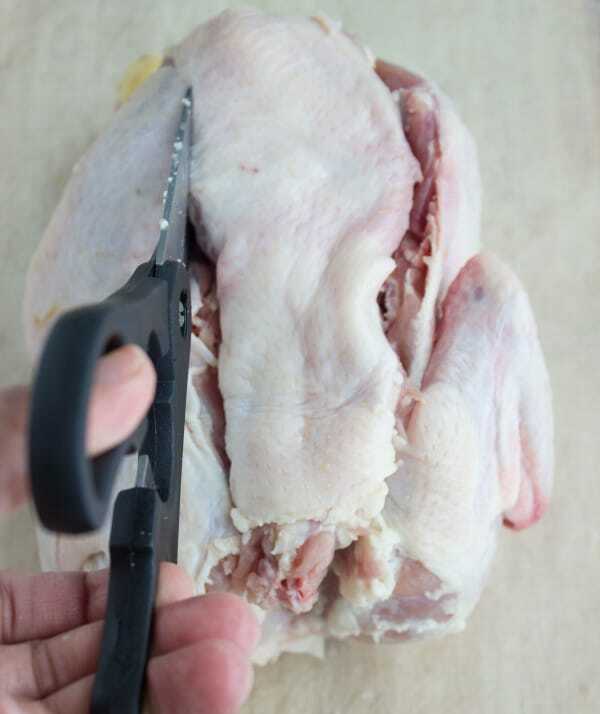 Take kitchen scissors and follow the backbone of the chicken from neck to bottom and from both sides. Cut off the backbone entirely from side to side and top to bottom. 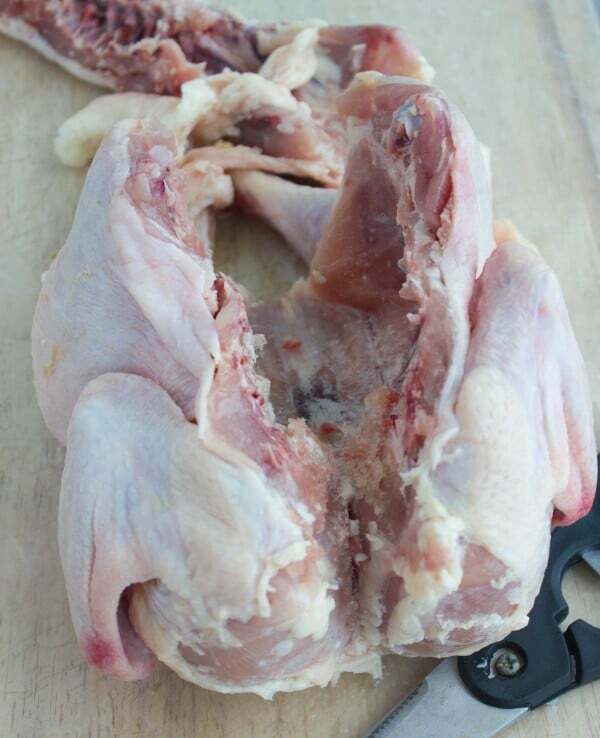 Then flip the chicken so the breast side is facing up, then take your hand and place it in the middle of the breast and push it down to break that middle bone and flatten the chicken completely.